This was not the plan this year for our tree. 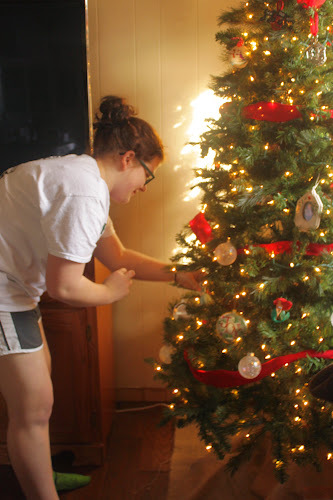 We were going to purchase a real tree for only the third time. Being a ministry family this is a super busy time for us. The first two weeks of December we have something to attend more days than not, so we didn't have the time to pick out a tree and get all the things needed. Finally Darling Daughter said I just want a tree, let's just stick with our artificial tree. Our tree is a few years old and is not expensive, but I always get comments on how full and lush it looks. Well I have a secret! 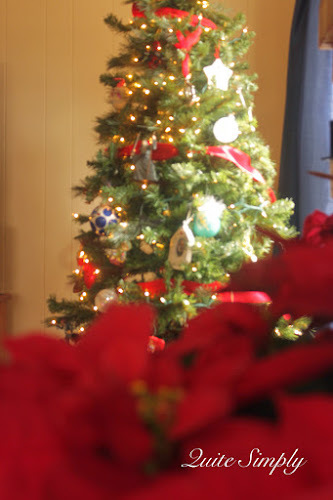 My tree is prelit, although this year we have a section that is not working! (Maybe I'll go shopping after Christmas.) After assembling the tree and shaping it I add greenery pieces. 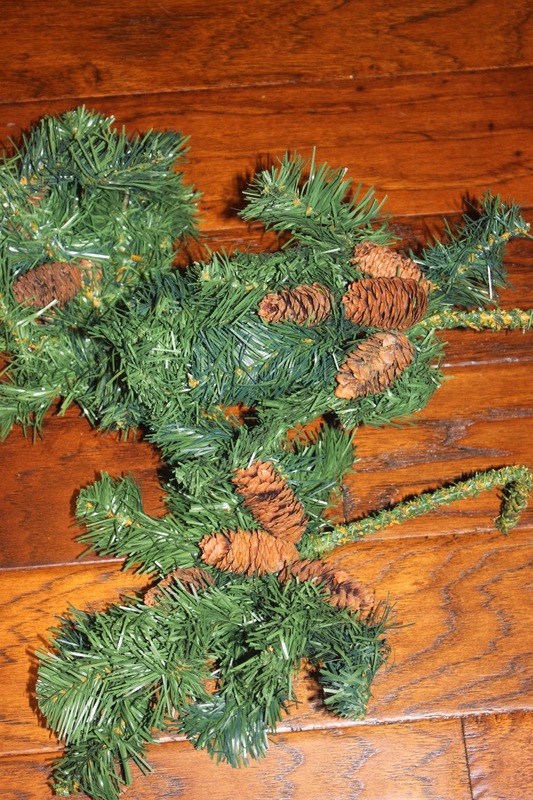 They are just a branch with pine cones meant to use in arrangements. I bend the ends to make a slight hook and shape the branch adding to areas in my tree that are lacking. I use the hook to attach it to the pole of the tree. They end up being mostly on the interior of the tree and hide not only the pole, but any gaping holes. I purchase them after Christmas and usually get them for around 50 cents or less, I must be the only one using them because I always have plenty to choose from, I probably have 30. I purchase ones that are similar so that the tree has a unified look. 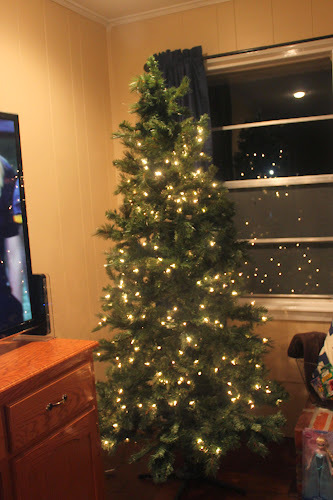 After adding in the greenery, I use another strand of lights or two to cover any green spots with no lights or this year nonworking, sections. Then decorate as usual. 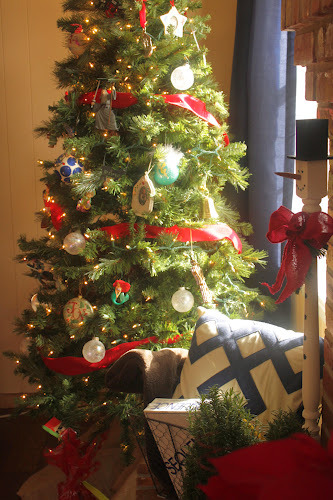 If you have any heavy ornaments, make sure to hang them on branches that are apart of the original tree, but the lighter ones can be hung on the added greens. This is how I give the illusion of a more expensive full tree! It is a super easy and budget friendly! Remembering that it is Christ we celebrate this Christmas Season! Thanks for sharing your tips on a luscious tree! Stopping by from Kelly's Korner. If you get a chance, stop by #36. Happy Holidays! Thanks for stopping in, looking forward to dropping in! That is a genius idea!! We have been using a fake one the past few years and I always thought it looked really sparse. I will have to look for some branches on sale after xmas and fill it out like this next year :) Thanks for the tip! It really makes a difference! Thanks for stopping by!